See the new designs here. Boeing is one of five companies testing a prototype habitation module on Earth for NASA's Lunar Gateway. 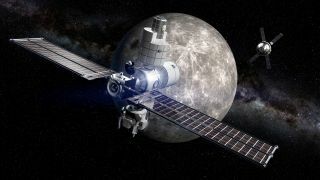 NASA's Lunar Gateway space station design process is beginning to take shape: The agency has announced five new prototypes that it plans to test on the ground. These habitats aren't actually designs to use at the moon, but are more for NASA to learn about the interfaces, requirements and design standards for a future habitat module for U.S. astronauts, the agency said. Gateway would provide an orbiting base around the moon from which astronauts could descend to the lunar surface or go farther into space. "These tests were formulated so that we can do a side-by-side comparison of very different and innovative concepts from U.S. industry," Marshall Smith, who leads human lunar exploration programs at NASA Headquarters in Washington, said in a NASA statement. "While we won't dictate a specific design when we procure the U.S. habitat, we will enter the procurement phase with far less risk because of the knowledge we gain from these tests." This news comes just weeks after NASA announced that, following a directive from the Trump administration, it would aim to land astronauts on the moon by 2024. NASA is planning the Gateway to be ready in the 2020s for human habitation. Testing at NASA's Kennedy Space Center, Florida: Lockheed constructed a Multi-Purpose Logistics Module (MPLM) originally intended for the International Space Station. This MPLM will support NASA's Orion spacecraft (which will transport astronauts to and from the Gateway) and includes a space that can be changed for different types of missions. Testing at NASA's Johnson Space Center, Texas: Northrop is using a design that will take advantage of its Cygnus spacecraft, which sends cargo to the International Space Station. This particular module can be changed in different ways, and its focus is on a "comfortable, efficient living environment" for the astronauts, NASA officials said. Testing at NASA's Marshall Space Flight Center, Alabama: Boeing is used to constructing space stations, as the company is the prime contractor for the International Space Stationand has developed multiple elements on the orbiting complex. The company will use this "heritage" knowledge in their own module, which includes some areas that can be isolated for payloads that need to be operated in different cabin atmospheres. Boeing also plans to optimize the available volume, although the statement did not specify how. Testing at NASA's Johnson Space Center, Texas: Sierra Nevada is responsible for the Dream Chaser that will eventually participate in space station cargo runs. This space station module it is putting forth is a Large Inflatable Fabric Environment (LIFE) habitat that is supposed to launch folded up, then inflate in space. Inflatable structures tend to have more living space that traditional rigid structures, because the rigid type is constrained in size by the rocket used to launch it. LIFE will thus have a large three simulated floors of living area. Testing at Bigelow Aerospace, Nevada: Bigelow will demonstrate an expandable module called the B330 prototype. The module provides 330 cubic meters (roughly 11,600 cubic feet) of living space. Bigelow previously sent a Bigelow Expandable Activity Module (BEAM) to the space station, where it successfully completed a two-year testing mission. Its time on the station was extended so astronauts can use it as a storage unit. Concept Study: To house astronauts, NanoRacks plans to use a pressurized, used rocket propellant tank. The fuel will be flushed out by exposing the tank to space, and then the module will be repurposed for human habitation. NanoRacks has already completed a feasibility study, and is now working on full-scale prototypes that would in part use robotics to convert the tank into a livable space for astronauts. Currently, NanoRacks provides commercial space on the space station for companies, organizations or individuals to perform experiments or deploy payloads.